'Bonniecrest', the Stuart Duncan estate designed by John Russell Pope c. 1914 in Newport, Rhode Island. Duncan was a banker from the midwest. The house has since been converted to condos. Click HERE to see 'Bonniecrest' on google earth and HERE on bing. 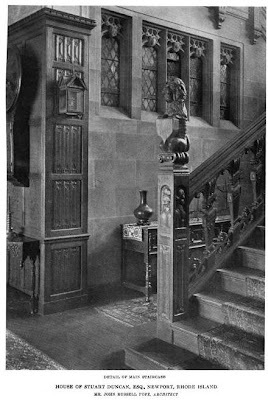 Photos from The American Architect, 1915. Best of the best. 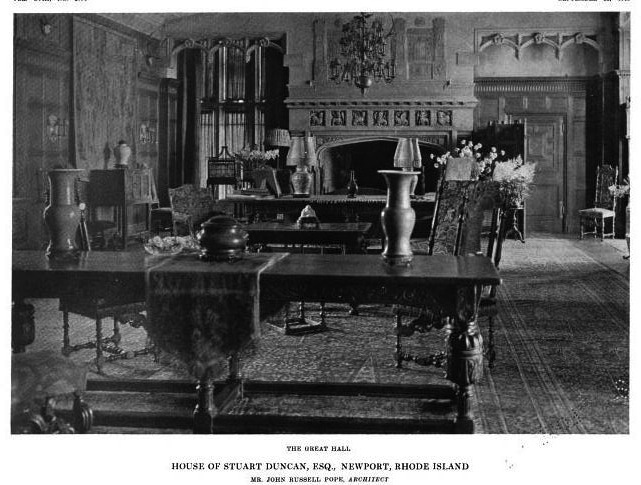 These pictures show it before the addition of a ballroom wing for a Duncan daughter's coming out. I'm told that the ballroom alone, a vast Tudor great hall, has been carved into four apartments. 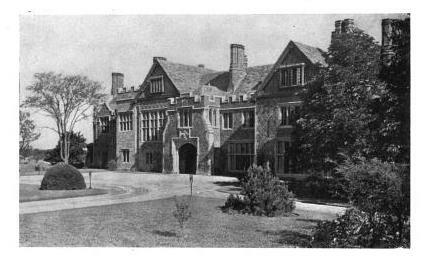 One of the big preservation battles of some decades back involved the purchase of Bonniecrest by a man named Louis Chartier, a Newport local who bought up many of the big estates at the bottom of the market in the decades after WWII and carved them up for housing and/or demolished them. Probably no other one person was responsible for so much damage in that community. He was definitely one of the four horsemen. By the time he got his hands on this place in the seventies, the market was rising, so he built condos instead--over local protest. 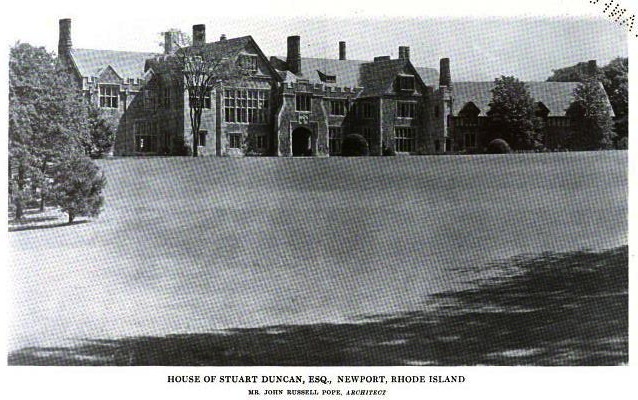 In the process, an almost unbelievable amount of real estate value was thus created out of what had been the Duncan's spectacular rolling lawns, landscaped by the Olmsteds. Single condos now sell there in the million dollar range. The buildings, huge and square, are almost indescribable blots on the landscape. They look from the outside like any cheap 'garden' apartment complexes in a lower end suburb. Not happy with that, he then bought the Burden place next door (designed by Peabody & Stearns) and did it all over again. PS Zach, it has always been my understanding that the foundation of the Duncan fortune was Lea & Perrin's Worcestershire Sauce. Dilettante is correct . . . that whole area has lost it's "historic" designation because of this development there. What is not known today is that Chartier was a roofer by trade and would lay slate for fifty cents an hour back in the 1930s !!! 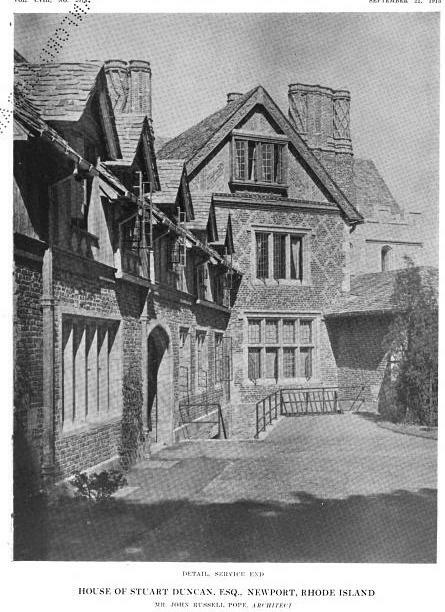 To obtain more slate he bought and demolished old buildings, and mansions ! 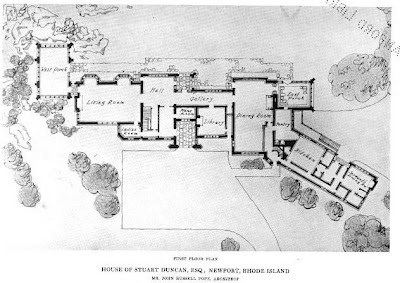 He later went into "development" and later converted John Russell Pope's own house, "The Waves" in apartments. As far as the Duncan fortune went . 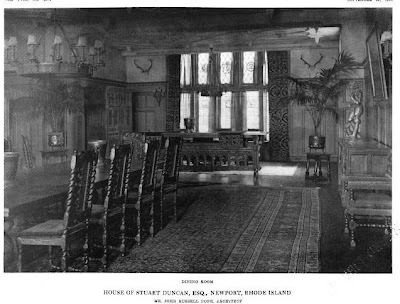 . . Stuart's father, old John Duncan, had a grocery provision store, with a bar in the back, up at Fourteenth Street and Broadway in the 1880s. The old man made a fortune in Worcestershire sauce, and the bar did all right for him as well !!! entering and leaving these premises than there were "wives" !!! Neighbors protested in vain to the deaf ears of the "authorities", who, perhaps, behaved like sailors themselves on occasion !!! With such a footing he had future Newport development whipped to a Custard !!! This place is a beauty. At least it wasn't completely destroyed. 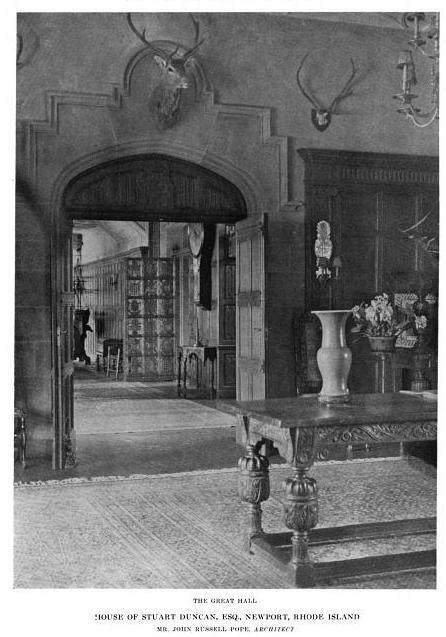 Did that spectacular iron gate in the entrance hall survive? Old Grey Dog: Marvelous! I've always wondered about Mr. Chartier and his pillage of Newport, and your amusing tale does nothing to make him more savory. Up here, Bar Harbor had the twin plagues of the Collier and Cough families, who have done more than any others to ruin and destroy their town for a quick buck. They're probably responsible for more destruction than the depression. I lived in one of the smaller apartments at Bonniecrest in the early 70's - met my husband there. Most of the apartments were rented by young USN officers who were attending the Destroyer school. 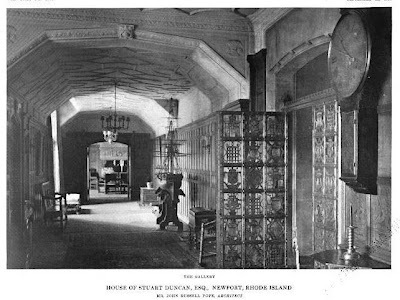 The apartments were all furnished with some fine antique furniture and oriental rugs. All of the door knobs, and many of the switch plates were sterling silver. The gates in the main hall that someone asked about were not there. The ball room was closed and used to store furniture. The grounds were still intact and well cared for. 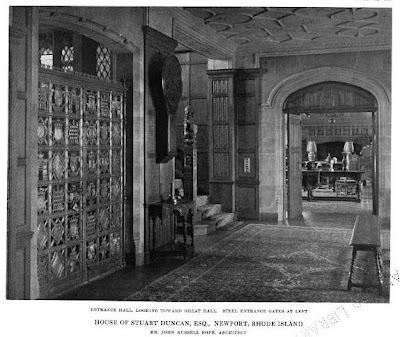 The wood work in the main hall was well cared for and beautiful. 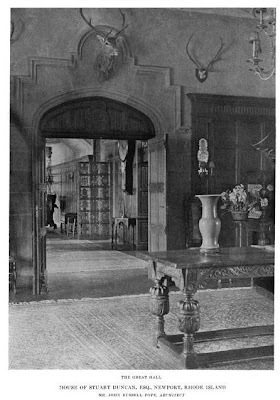 We always marveled that someone did not come in and remove the beautiful silver sconces that were mounted on the walls of the main hall. 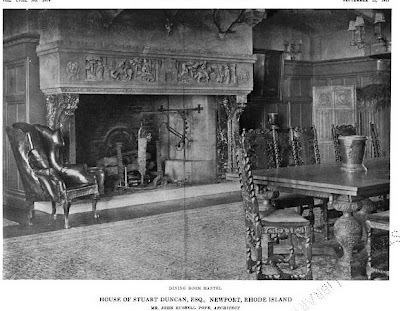 The dining room was then the living room of one of the apartments and it had that wonderful huge fireplace that you could literally walk in and sit down on a stone bench. It was a wonderful place to live and we had some great parties!! Some of my fondest memories are of the time that we lived at Bonniecrest. We were very sad to see what has been done to the beautiful grounds - the buildings built on the lawn are so tacky! It brought tears to my eyes. Hard to believe that it was 40 years ago that we lived there. So many of us that lived there met and married and remain married to this day. 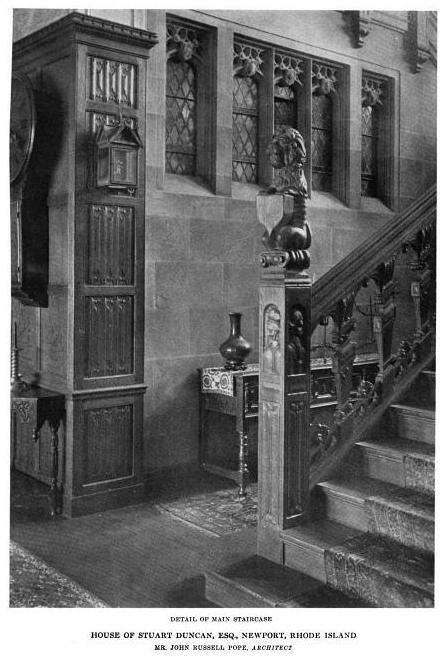 In response to "The Ancient's" query regarding the elaborate iron door; it just so happens that my Mother resides in an upstairs condo in the Main house. I have visited her frequently, and, YES, the amazing gate is still there in the front hall. My Mother and Father moved into the main house in 1977, when it had already been made into apartments, but they were rentals, and went for (if I recall) $550 a month. The original landscape had yet to be destroyed, and it was very beautiful. If I can dig up some old pictures, I will attempt to post them here. In the early 80's, the house was converted to condos, and that is when they did such a disgraceful job destroying the original character with those horrid buildings. The landscape now is still beautiful, and well maintained, (my Mother insists I write), but in my opinion, the original landscape and character was far more enchanting. I am sitting in Bonniecrest right now. My wife's aunt owns two condos on the third floor of the East Wing. I came upon this blog while trying to discover the mansions rich history. Looking at the original photos is rather depressing. I've noticed that the figure on the main staircase is different. In the original picture it looks like a lion of some sort, but now it's a man (Sir Duncan perhaps?). 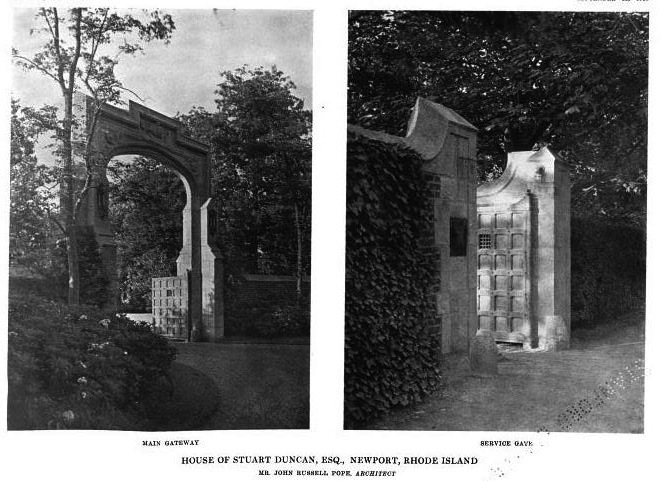 The big gate is still there but I wish I could have experienced this magically place in its original form.